Tag Archive | "graphic novels"
The works of H.P. Lovecraft have inspired hundreds of other writers; in the 1970s, his stories became popular material for the growing underground comics movement, and that popularity, though it waxes and wanes, has yet to vanish completely. Currently enjoying an upsurge in interest, one of the latest offerings, Boom Studios’ Cthulhu Tales, brings brand new Lovecraft-inspired material to the graphic novel format. I was excited to see these when I attended C2E2 in Chicago, and purchased volume one of the series with great anticipation. Wizard Entertainment Chairman Gareb Shamus has loaned from his personal art collection all 12 original Watchmen covers by artist Dave Gibbons. The covers will be put on display as part of the Museum of Comic and Cartoon Art’s special exhibit called “The Art of Watchmen.” The exhibit coincides with this Friday’s much-anticipated opening of the Watchmen film, which promises to be one of the biggest movie events of 2009. I’ll start this with a confession. Witchblade Volume 5 is the first example of the Witchblade universe that I’ve had the pleasure of reading. I wasn’t completely ignorant of the series. I wrote a profile of artist Mike Choi a few years ago which required some research, but Witchblade is one title that’s never screamed, “Read me!” Why does this matter? Because this review will split everyone into one of three camps – Those of you who, like me, have never read the series, Witchblade fans curious to read a rookie’s perspective, or Witchblade fans who angrily utter the word, “Duh!” over the next few minutes more times than is ever appropriate. The value you get out of this review will depend squarely on where you decide to camp. When manga comic book styles meet a popular author’s work, the results can be either spectacular or disappointing. Christine Feehan’s Dark Hunger is paranormal romance mixed with a highly stylized art form that does what it sets out to do — entertain fans and entice new ones with a bit of passion and lust. What I liked about this particular manga interpretation, was that this product is the whole package; the cover art shows the two main characters (Riordan and Juliette) as they appear in the book. With cover copy that shows off the “romance” in the work, you know what you’re getting into when you read it. Top Cow Productions, Inc. announced it will publish the first, complete story arc of William Harms Impaler in a new trade paperback that will debut this October, and then will launch a new series for the property in December. Jim Butcher’s Harry Dresden is back and invading the world of comics in a series entitled, Welcome to the Jungle. Don’t know who Harry Dresden is? Well, if you haven’t met Chicago’s favorite wizard yet, this four-part comic series is a good introduction to the world of Harry Dresden and his friends. In Welcome to the Jungle, Harry Dresden has an unusual innocent to save–a gorilla named “Moe.” Accused of violently murdering a victim in Lincoln Park Zoo, Harry Dresden rushes in to investigate, spurred on by Lieutenant Murphy. Just when he picks up the trail of the “real” killer, things get sticky as our lucky hero gets right into the middle of a death match with supernaturally-charged lions. With a little help from his partner-in-crime, Bob, Dresden tracks down the source of the possessed animals–but is it too late? Will Dresden be able to stop a big evil from taking over Chicago? Cy is an ordinary guy with a beautiful fiancee — until his uncle’s suicide changes his life forever. Consumed with discovering the motive behind his relative’s sudden and painful death, he finds notes and scribblings about a nonsense word he doesn’t recognize… Cthulhu. Obsessed, he seeks out answers to questions he should have never asked. A horrifying glimpse into a modern day Lovecraftian world filled with nightmares and excursions into Lovecraft’s Dreamlands! The Fugue collects the first several issues of the Fall of Cthulhu comic book series. This is a modern tale of the Cthulhu Mythos featuring several well-known elements of the setting that have been built up over the years in various novels, anthologies and role playing games. The treatment of Miskatonic University is a great background element throughout the story, for example. Do you like slasher films? How about the one where this really, gorgeous girl gets chased by a guy in mask? Ever wonder what would happen if the girl fought back? Enter Cassie Hack, a girl with a violent past. You see, Cassie wasn’t well-liked as a teenager in her school; kids would taunt her, call her a freak. Her mom–in her own, over-protective way–tried to stand up for her daughter by killing those vicious snobs and serving them up to other students as mystery meat. Of course, with an influx of protein into the diets of those kind, innocent kids, someone had to notice. When Mrs. Hack was confronted to pay for her crimes, she committed suicide by sticking her head in a pot of boiling gravy. 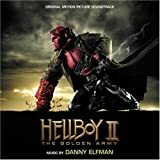 As a fan of Big Red, I was eagerly anticipating seeing this sequel to Hellboy after watching the Hellboy and the Golden Army trailer and hearing about Guillermo del Toro’s involvement with the film. Impressed with del Toro’s work on Pan’s Labyrinth and Christopher Golden‘s novelization of Hellboy with artist Mike Mignola, I went into the movie with certain expectations. Like other films and content within the Hellboy franchise–you do not need to be familiar with the characters or the setting to watch this film. Screenwriter Rick Loverd weaves a tale of superheroes, Norse mythology and bone-crushing action. Top Cow Productions Inc. announced at San Diego Comic-Con they will partner with Milo Ventimiglia and Russ Cundiff of DiVide Pictures to publish Berserker, a new comic book series created by Rick Loverd. With sold out shows and talks of an Oscar, if you haven’t seen The Dark Knight you’re probably wondering if it lives up to all of the hype. Even within the body of countless movie reviews for the film there are a few who, believe it or not, don’t like The Dark Knight. Why? You see, the one thing this comic book movie has at its core (that other movies of a similar type don’t) is an atypical visibility to a broader audience. While it’s impossible to find a true statistic, could it be safe to assume that people unfamiliar with the darker Batman franchise went to see the movie just because it was Heath Ledger’s last role? After reading the first two issues of Marcus Almand’s comic book, Razor Kid, I’m left feeling surprisingly compelled to read more. Razor Kid is as indie as it gets, but this does not belie the effort that Almand and his revolving crew of artists have put forth in giving readers a superior product. 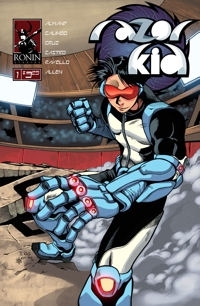 Issue one introduces us to 15-year-old Alexander Tanaka, AKA Razor Kid, as he fights Kevin Michaels in an exercise of initiation into the C.A.P.E. (Citizens Authorized for Protection and Enforcement) program. Alexander is a boy genius who’s developed an armored super suit equipped with an assortment of blades and devices including cybernetic arms that replace his own which have been amputated. Kevin, 18, provides quite a test as he appears to be a full-blown martial arts badass. In this hardcover edition of Anita Blake, Vampire Hunter: The First Death, fans will get both issues in the series, as well as the Anita Blake, Vampire Hunter: Guilty Pleasures Handbook. Published by Marvel with a retail price of $19.99, the book is a prequel to Laurell K Hamilton’s best-selling novel Guilty Pleasures, which is the first in the Anita Blake series. Adapting a comic book from a novel series isn’t an easy thing to do, because of the novel’s rich format, rife with details and setting descriptions. Additionally, the Anita Blake series is told from the first person point-of-view, which can be challenging to display visually in a graphic novel. Stray too far from the point-of-view, and you may encounter oddities–things that the main character (Anita Blake) may be describing but hasn’t seen yet. A nod to the writing team of Laurell K Hamilton and Jonathon Green, each scene was pointed and specific to Anita’s character. Dabel Brothers Publishing announced today that they will adapt Robert Jordan’s bestselling Wheel of Time series, which has sold more than 14 million copies in North America alone, into comic book format. The first issue is scheduled to release in December 2008. “And what have you done lately?” So ends a fast-paced, winner-take-all honey of a comic book brought to life. 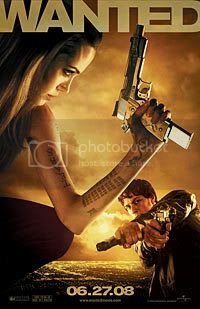 Wanted builds from a nicely sardonic character study through a romp of an action film into a colossal final fight built around a twist that suddenly catapults the movie from a fun night out into an edge-of-the-seat thrill ride. It may start out slowly, but this movie ends with a bang so big, it will leave you grinning with malicious glee. All nice words aside, don’t go to this movie looking for high drama and a soaring intellectual quotient—although the movie does, at times, make witty, ironic jokes worthy of a wry smile. But if you enjoy a dark comic book writ large and riddled with as much wordplay as bullets, then this is the movie for you. Flames Rising was fortunate to attend Wizard World Chicago this year, at the gorgeous Rosemont Convention Center in Des Plaines, Illinois. This was our first year at the convention, and we’re happy to report that we are making plans to go back next year. What do you get when you mix an ancient Sanskrit epic that is integral to the Hindu religion with a graphic novel? You get Ramayan 3392 A.D. Created by Deepak Chopra and Shekahr Kapur, the graphic novel attempts to transcend the boundaries of normal storytelling into this visual medium. Is it successful? To put Ramayan 3392 A.D. into perspective, think about what it must have been like when Marvel Illustrated’s staff put together Homer’s The Iliad into graphic novel form. This particular graphic novel is a re-imagining–not a re-telling–which is an important distinction to make.